If Re-Elected Will Sherri Lightner Implement Voter Approved Pension Reform? Posted on October 19, 2012 on the VOSD. City Councilwoman Sherri Lightner declined to answer a question at a community forum Friday afternoon. The question wasn’t particularly interesting, but Lightner’s silence was. The forum’s moderator asked Lightner to explain her position on Proposition B, a high-profile pension initiative that voters approved in June. Among other things, the initiative will replace pensions with 401(k)-style plans for most new city employees. 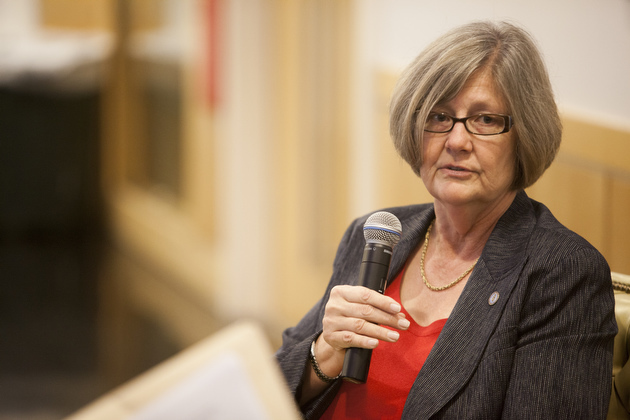 While campaigning for re-election, Lightner has repeatedly said that she supports the pension initiative and its implementation. The moderator asked Lightner whether she believes the initiative is fair to city employees. Lightner didn’t elaborate, but the comment played into one of her challenger’s most common lines of attack. Ray Ellis has argued at debates and forums that Lightner doesn’t truly support the pension initiative. Ellis didn’t attend Friday’s forum. Lightner’s comments at the forum appeared to signal her possible hesitation about the pension initiative. Lightner did not provide much clarity in a brief interview after the forum. Lightner’s staff interrupted the interview and said she had to leave. I told Lightner I would be writing a story about her comments and asked her to call me and clarify her position on the pension initiative. She did — and she backtracked on her forum comments. This time, without hesitation, Lightner said the initiative is fair to city employees. She said pensions and 401(k)s can work equally well. Why didn’t she just say so when asked directly? Lightner blamed fatigue, and said she had received a flu vaccination Thursday and still wasn’t feeling well. “I was really, really tuckered,” she said. The forum lasted about an hour and because Ellis didn’t show, Lightner talked most of the time. The moderator asked the Proposition B question in the last few minutes.